Move over Mel B - we're taking animal print back. From zebra and giraffe to Scary Spice leopard shorts, we want it all (just not all at the same time). Mix and match your favorite printed pair with a relaxed T-shirt for the ultimate poolside look, or throw on a leather jacket and heels for a night on the town look that'll get you noticed. 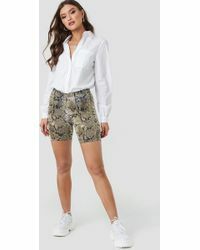 We love The Kooples' leopard-print shorts or Roberto Cavalli's zebra-print style to liven up any outfit. Think beach holiday chic for how to wear the look this season.